In my considered view the best guard posture (kamae) for karate is one where you hold one hand in the same position as the lead hand in chudan uke (the standard karate chest level block), but at face height. The other hand is about in line with the elbow. There are variations on the heights of the arms, but not in the distance from the body. The fists should be turned - not fully over (palms up) but slightly angled in. The first thing you’ll notice about this guard is that it is substantially the same as the guard adopted by bare-knuckle boxers of old. If there is any difference in my particular version, it is that my shoulders are more rounded (this being an influence from my study of the internal arts). The standard karate kamae is otherwise more or less identical to the old bare-knuckle guard and nothing like the boxing, kickboxing, MMA guards or Muay Thai guards. In short, karate is a bare-knuckle discipline where the others I have referred to are either gloved sports or derived from gloved sports. Accordingly different biomechanical factors apply and hence different tactics/strategies are required in each discipline. For a start, take a look at the boxing type guard shown to the left: The closed fists are held close to – sometimes even touching – the face. This is fine with gloved sports because your padded gloves provide an effective shield. The same cannot be said about bare-knuckle fighting. If you keep your fists near your face you risk getting your own knuckles rammed into it. And this hurts at least 90% as much as getting hit full in the face without any shielding. 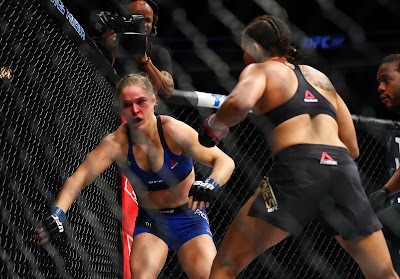 It can be 99% if your fist is actually resting on your face before you get hit. Bare-fisted "shielding" doesn't work. I know from experience. The Muay Thai variant often assumes a slightly different approach where your fists are actively turned so that the palm side faces your opponent. Now there are good reasons why you might raise your open hands this way at the commencement of a conflict; open palms held up are a “non-aggressive” gesture and can help diffuse a situation rather than escalate it (a danger if you raise your fists). But to persist in this guard posture once a fight has commenced again defies bare-knuckle logic. You don’t want the “soft underbelly” of your forearm exposed to being hit by your opponent’s sharp knuckles. It is painful to be hit there and a hard blow can hamper the effective use of your arm or arms. The upper side of your forearm is, by contrast, more conditioned and resistant to blows. Furthermore, the old bare-knuckle posture is angled so that blows are deflected down the arm. I don't agree with this statement at all. You can perform a normal punch (or any variation) from a “palms facing me position”. In fact you can avail yourself of the corkscrew, which in itsef is also a "wedging" deflection. I use this move to deflect and attack in one movement (ie. my punch is deflecting an attack). In other words, the "re-alignment" is part of our attack and defence strategy. It doesn't slow you down any more than normal corkscrewing does. However remember that when we say "palms up" I don’t mean twisting your arms right over so that the palms are perfectly up. As noted previously, both palms are angled slightly inwards so that the position still feels natural. 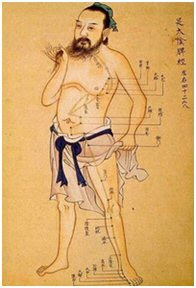 Turning the palms right over, either face up or down, so that there is undue tension in the muscle is not a good idea. But by far the most important reason why karate favours the old bare-knuckle kamae is that it enables the utilisation of karate’s blocks/deflections/parries. In this respect, the hand positioning is nothing short of essential for karate to be used effectively. For more on this topic see my articles “Why blocks DO work” and “Evasion vs. blocking with evasion”. Your standard basic "blocks" groove you through various kamae postures. They keep your hands in the same "square". 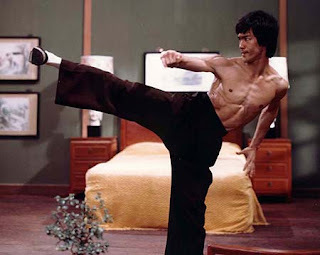 In basic kumite you keep your arms in these standard postures, but this is to remember to keep your guard up in an accessible position for deflections/counters etc. If you use anything other than a mid to slightly extended guard (akin to the "square" your arms inhabit while blocking) you're kidding yourself that you'll be able to intercept incoming blows with your deflections. If your hands are too extended they will not have enough "load" to deflect. And neither can your hands be next to your face: this is fine if you're resigned to using evasion only, but this is not karate. Your hands need to intercept the attack early and if you've left them by your face you have no choice but to swat the attacks "like flies" as “blocking naysayers” are often fond of saying (ie. you'll have left deflection to the last minute when the attack is travelling at its fastest speed - again, see my articles on blocking above). In that case you're better off doing boxing, Muay Thai, MMA etc. (there might be nothing wrong with that, especially in a sports ring/arena, however this is not karate and requires very different training in very different skills and tactics). 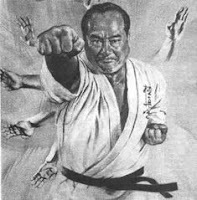 I assume the karate kamae as I enter the “melee” range (again, see my articles “The ‘melee’: karate’s fighting range” and “Staying in the melee”). The karate kamae controls your opponent and keeps him or her in the melee until you're ready to close (if you so wish) or back off if you need to. In other words, you're keeping your opponent at 'blocking' or 'deflecting' range. Half a step back and you're in 'kick blocking range'. Half a step in and you're in elbow/knee range and grappling a bit in from that. As I make this comment I am fully aware that, like stances, the position of your hands in combat changes from moment to moment. When you are in the melee this is a given (you should be flowing from one attack to another). The only time you resort to a static formal kamae is in the (unusual) event that you disengage and circle each other at range – ie. you exit the melee (I've yet to see that on surveillance video of real fights - discounting delinquent juveniles or adult idiots who film themselves for Youtube etc.). Regardless of the fact that fights occur in a continuum, having an idea of the correct “static” guard or kamae is still important and should underpin one’s defensive strategy, in much the same way as one learns basic stances for stability, posture and power maximisation. Keeping your guard up is always going to be an important part of self-defence. The bare-knuckle guard’s approximation to the “chudan uke” (chest level block) is more than accidental. It is a simple matter of applying the angles of deflection against the angles of attack. Since basic physics is in issue, it should come as no surprise that the karate guard and the old bare-knuckle boxing guards look the same despite the completely separate evolution of those disciplines. On the other hand, as I've said in my article about "Secret techniques", I'm sure many out there will simply dismiss this. More power to us karateka. Extremely helpful article; adds a new angle for me in thinking about kamae. 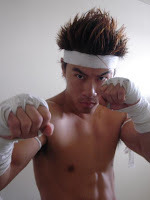 I am from Shotokan with a tiny bit of dabble in Wingchun and Kyokushin. 1. Do a gedan barai with the lead hand and then quickly bring the lead hand back up. Or..
2. Block with the rear hand so the lead hand stays up. Or..
3. Block with the lead hand and simutaneously counter attack with the rear hand with the lead hand in lowered position. 4. Block with a knee raise. 5. Evade the lower kick by stepping back or sideways. No block. Hi and thanks for your kind words. I guess the answer depends on how low the kick is. If it is to the tanden/dantien or solar plexus I will usually use a gedan barai with the lead hand OR reverse hand - depending on whether my momentum is moving backwards or forwards at the point of attack interception. Simultaneous block and counters are extremely overrated in my experience (by "simultaneous I mean your option 3)! If I can evade without a block I will always do so, but this generally means the kick is out of effective range anyway. If the kick is lower than tanden/dantien I will use the edge of my foot to jam, my shin (ashibo kake uke) or my ankle to hook/deflect his attack (ashikubi kake uke) or the sole of my foot in an upward swing (nami ashi) - depending on my positioning and his type of kick etc. Feel free to join our discussions at http://www.tfaforum.com where we discuss this kind of thing all the time! Some good folks there who might give you a very different perspective! 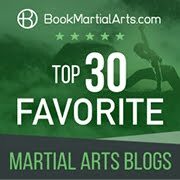 Like your previous articles it gives a great insight to karate. I have been eagerly reading many of your exceptional articles. Thank you very much for sharing what you know. It especially means a lot because I'm between dojo(angs) right now, and have no teachers but those I can find online. So thank you! Oh, but now my question: As a small man (140lb), I've found that people frequently grab my guard. They use these grabs to easily break my structure and make me feel quite foolish. I've been having a lot of trouble countering these grabs, especially double hand grabs. I don't suppose you'd know anything I can do to improve this without anyone physically there to provide resistance, do you? Hi Nathaniel and thanks for your kind words. Yes, there is something you can do, although it would be better to have a partner. For practice, the partner needn't be large, but obviously the larger and stronger the better. The main thing however is to have a partner to test out the angles etc. However you can still go through the motions without a partner until such time as you have one available. If you like, I'll film some of the simplest and most effective breakouts for you. Give me a week or so. If you want, email me directly at dan@dandjurdjevic.com and I'll tell you when the video is up. Here is my latest article that hopefully answers your queries. Once the attacker figures out that the gap is not really and opening and start swinging wide, the posture is still an excellent one to use for a double arm destruction at the mid-bicep and wrist. This can be applied with minimal movement to either the left or right arm of the attacker. I was shown this by both Matsumura Seito and Ryukyu Kempo instructors. I've had good luck using it in kumite. Indeed, you're absolutely correct Ryan. Thank you for writing such an insightful article! Would you be able to answer a quick question regarding the guard? In order to facilitate the creation of "Clayton's gap," would your fists be positioned slightly on either side of the centerline, instead of being occupying the center line? Additionally, does such a "gap" only exist when facing an opponent in an unmatched stance (e.g. right lead vs left lead)? Thank you so much for your time, and I look forward to reading more of your articles in the future! Your hands should be either side of the center line, on the quarter lines. The "gap" is independent of matched/unmatched stance. Thanks for reading and for your questions! Quick typo fix for my previous comment: Instead of being occupying-->Instead of occupying. Thanks so much for your reply Dan! Clayton's gap reminds me very much of the concept of "outside sliding leverage" in Jeet Kune Do. By my understanding, the only difference is that Jeet Kune Do's "outside sliding leverage" is generally performed with a straight lead punch (but along the same angle as the "Clayton's gap" deflection). Since the "gap" is independent of matched/unmatched stance, when facing an attacker with the same stance, how would the "gap" come into play against a lead hand straight? When facing such a "jab" while in a matched stance, would the defender's rear hand be able to deflect the punch in the same manner that the defender's lead hand would against the attacker's rear straight? (To be more specific the defender's lead hand here is inside of the attacker's lead hand.) My worry is that the defender's rear hand would not have enough time to react since a rear arm deflection lacks the "distance advantage" that a lead arm deflection has (which would allow a lead arm to deflect a blow further out, altering the incoming trajectory of the blow before it gets too close). Do you think that a rear hand "Clayton's gap deflection" be too slow against a speedy "jab", and if so, would a pak-sao/boxer's catch palm block be safer? Additionally, I've often trained in a manner where my hands occupied the center line, but I am definitely looking forward to trying out your guard! If I may sneak another question in, what are your thoughts on the advantages/disadvantages of occupying the center line with the hands as opposed to utilizing "Clayton's gap." Thank you again so much for your time! I hope I've managed to adequately frame my quetions, as it can sometimes be very difficult to describe such movements using only text, and I hope I am not trying your patience by asking you too much! "Since the "gap" is independent of matched/unmatched stance, when facing an attacker with the same stance, how would the "gap" come into play against a lead hand straight?" It wouldn't. It would however come into play against a straight reverse punch. If you wanted it to work against the lead, you'd have to swap your own lead hand. 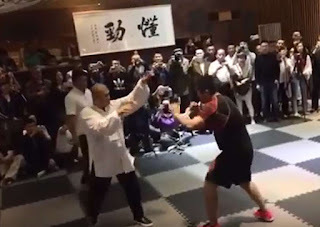 "When facing such a "jab" while in a matched stance, would the defender's rear hand be able to deflect the punch in the same manner that the defender's lead hand would against the attacker's rear straight? (To be more specific the defender's lead hand here is inside of the attacker's lead hand.) My worry is that the defender's rear hand would not have enough time to react since a rear arm deflection lacks the "distance advantage" that a lead arm deflection has (which would allow a lead arm to deflect a blow further out, altering the incoming trajectory of the blow before it gets too close). Do you think that a rear hand "Clayton's gap deflection" be too slow against a speedy "jab", and if so, would a pak-sao/boxer's catch palm block be safer?" Basically the lead hand should be used to deflect. The rear hand is only a back up (or in case your attacker throws a lower level attack - hence the rear hand is held a bit lower) and is not suitable as a primary means of defence. It is really your counter hand. "Additionally, I've often trained in a manner where my hands occupied the center line, but I am definitely looking forward to trying out your guard!" Clayton's gab is about covertly controlling the centre line! Because you're controlling the quarter line, you seem to have left a gap along the centre. However you haven't (if you look at the angles). "If I may sneak another question in, what are your thoughts on the advantages/disadvantages of occupying the center line with the hands as opposed to utilizing "Clayton's gap."" I will write an article about the centre line soon. All I will say here is that there is a time and place for everything. The centre line theory is great, but it is far from a panacea. It works especially well against straight attacks, but it leaves you very open to hooks/roundhouse etc blows. Thanks for your patronage and your stimulating questions! I look forward to your article on the centerline! Using the lead hand as the primary defensive tool sounds very intriguing, possibly similar to how in swordplay, the sword is often the primary defending tool regardless of whether the off hand holds a buckler or a dagger. He then goes on how elaborate how the right hand performs a similar role to the dagger. Earlier in the book, he also discusses the evolution of boxing stance from a “swordplay influenced” right lead to the boxing left lead. All in all, a very interesting book, but I suppose I’ve digressed quite a bit! Returning to the matter of using the lead hand for defense, I am curious if you would use the lead hand to defend against a matched lead hook. Perhaps using Taijiquan's single whip, similar to the unmatched rear hook/"haymaker" defense you outlined in an another article? How could a lead hand defense be used against a matched "one two?" Perhaps a rising block could be used against the matched jab, but I am uncertain how the lead could stop the follow up cross without utilizing a "hard" (fighting force with force" block, especially since crosses often have a slightly looping element to them. To offer a historical example of an art that doesn’t use the lead hand as the primary defensive tool, I thought it may interest you that in bare-knuckle boxer's Mendoza's "The Art of Boxing," he advocated parrying/blocking blows to the right of the "centerline" with the right hand and parrying blows to the left of the center line with the left hand, in a similar fashion to Wing Chun's center line theory. 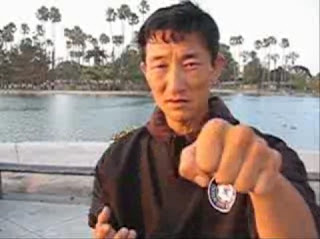 A more extreme modern example can perhaps be found in certain interpretations of Jeet Kune Do, which advocate using the rear hand as the primary defensive tool. "Using the lead hand as the primary defensive tool sounds very intriguing, possibly similar to how in swordplay, the sword is often the primary defending tool regardless of whether the off hand holds a buckler or a dagger." Yes, it is similar - except that in unarmed fighting you use both hands and can swap lead (as can your attacker). 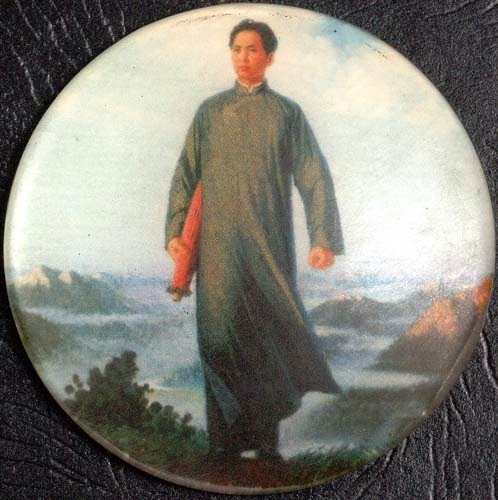 "For as long as he can contrive to preserve a straight wall of steel in a direct line from his shoulder down to his arm, so long will his body be impregnable to attack." Be aware however that in, say, sport fencing, you are restricted to thrusts, rather than circular attacks such as hooks or swings. "I am curious if you would use the lead hand to defend against a matched lead hook." You can, however this is just one way of dealing with the attack. When I said the lead hand is generally used for defence, I didn't mean it to be a "hard and fast" rule. In the end, you must use whichever hand is best. Given that I advocate a largely front-facing stance in a shortish stance (not, say, a long forward stance), there is really not that much difference between front and rear hands. I would probably use the rear hand against a matched left hook. "How could a lead hand defense be used against a matched "one two?" Perhaps a rising block could be used against the matched jab, but I am uncertain how the lead could stop the follow up cross without utilizing a "hard" (fighting force with force" block, especially since crosses often have a slightly looping element to them." You might use the lead arm twice even if that means going on the inside of the cross. That isn't so daft as it might seem. 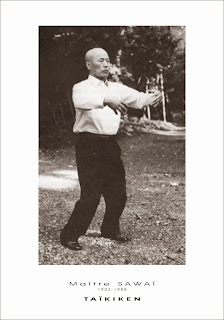 In fact taiji's brush knee is just such a movement. And it is "soft" not "hard". Otherwise you might deflect under the cross with a rising angle or simply use the other hand (which is probably easier to understand for most martial artists). "In genral my worry would be that the lead hand would have too much "space" to be protect, especially against curved blows or combinations. Again, I may be getting ahead of myself here, and perhaps I should just wait for your article! :)"
I don't have such a worry. To me, once your guard is up, you can intercept each technique as it comes (with the aim of "turning the tables" as soon as possible). I'll do an article in the future on combinations, including matched ones of the kind you describe. 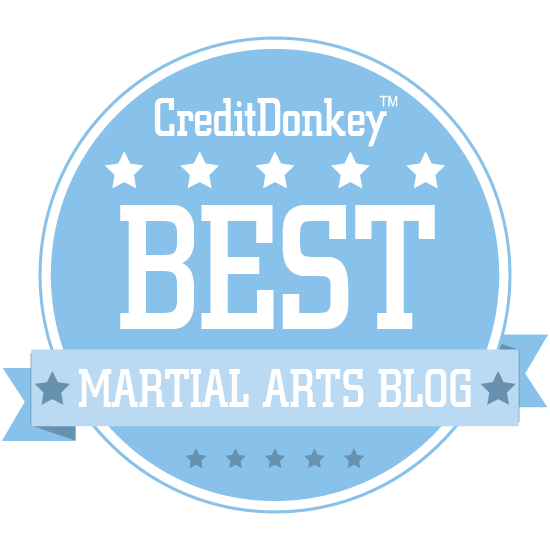 "A more extreme modern example can perhaps be found in certain interpretations of Jeet Kune Do, which advocate using the rear hand as the primary defensive tool." I agree this is more extreme. There is a time and place for everything, but making this the default screams of lack of understanding of basic timing issues and human biomechanics. Thanks so much for replying! You've given me a lot to think about, and I look forward to reading more!